1. Wire brush bristles. This one was a surprise to me when I did some research. Apparently, a bunch of people end up in emergency rooms from swallowing wire brush bristles that stuck to their food. Ouch! Use a brush without wire bristles, or a scraper. And be sure to look at the grill for stray bits of stuff stuck to it, and look over your food for bits of debris before you eat it. 2. Bacteria. Make sure to keep your food in the fridge until you’re ready to cook it. And don’t let it sit out too long at picnics and barbecues. Bacteria can grow surprisingly fast, especially in hot weather, and food poisoning isn’t fun. Make sure to wash your hands after handling raw meat, and wash your dishes and utensils that touched the raw meat thoroughly. Don’t use the same plate that touched the raw meat to carry the cooked meat. 3. Smoke. Inhaling smoke causes cancer. I think everyone knows that these days. There’s also carbon monoxide in that smoke, so stand clear of the smoke as much as you can. – Don’t char your food. 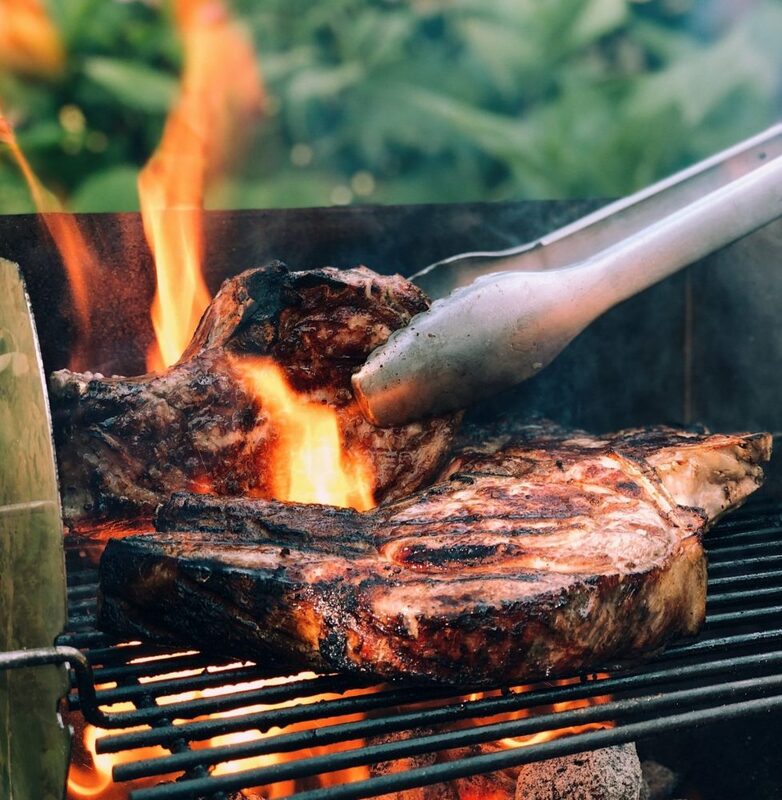 Charred meat, especially the fat, is even more toxic. – Trim the fat. I know the fat tastes the best, but if you burn it, it’ll taste nasty anyway, plus be more toxic. So, duh, don’t eat the burned part. – Use a rub to marinate food containing things like rosemary, thyme, pepper, onion, garlic. Besides tasting yummy, these kind of rubs have been shown to reduce the dripping fat and smoke, plus decrease the amount of toxic chemicals produced. Do you have a recipe for a rub for grilling marinade you love and want to share? Post it on our Facebook page so we can enjoy it, too! 5. Do grill veggies. Vegetables don’t develop the toxic chemicals that meat does when it’s grilled, so veggies are a healthy and safe option for grilling. 6. Watch the booze. Captain obvious here, but drunk, fire and propane tanks are never a good combination. Enough said. Enjoy your grilling in a healthy way!